Who are the 3 WISE MEN? I have been asked this question more than a few times. The title has overtones of a religious nature and there is a subtle, yet close connection, to the original three wise men of biblical times. In 3 WISE MEN there is a cover picture of three rather handsome-looking guys. Each of them has a key part to play in the secret formula. And, each of the novel’s three wise men live in quite diverse places. Of course, to say much more, would reveal too much and you might miss the suspense and intrigue! Happy reading. Why does 3 WISE MEN begin in Antibes? Why not start somewhere else, like the morning that Jak left to make his presentation? This would keep the plot linear, like most thrillers. As starting points tumbled through my mind it seemed to me that Antibes was ideal for one main reason – it was the crisis moment in Jak’s journey; the point where his one final hope became hopeless, the point where he begins to feel very vulnerable. Jak found something in Antibes that got his hopes up, and then he lost something very important to him. So, Antibes – with its beauty and literary history – is a pivotal marker in 3 WISE MEN. Antibes does, if you like, begin to put the wire of suspense under tension – ready to be released and continue to vibrate through the rest of the novel. Part of this tension is sprung when Jak finds out that Antibes was once the home for a famous spy – two actually! 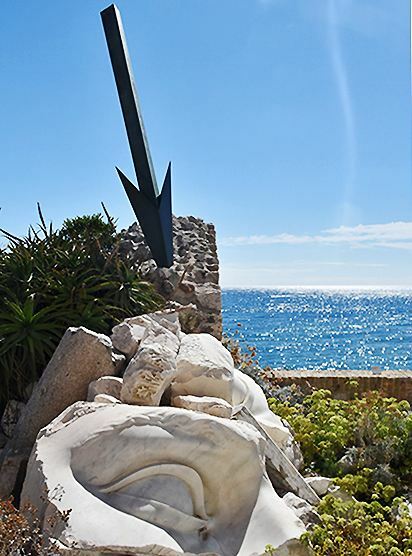 There is also a large arrow striking the ground in Antibes. Perhaps it is pointing to the start after all? The funny thing is, Jak spends about as much time in Antibes as my wife and I did while doing the research for 3 WISE MEN. 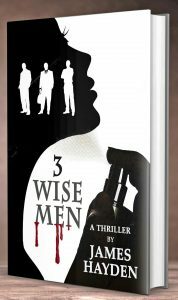 3 WISE MEN – A New Thriller! Jak Colins flies to Milan to share his priceless discovery – a powerful formula with the potential to disrupt a multi-billion dollar industry that has attracted men and woman since ancient times. But, he soon becomes the object of unscrupulous rivals who take drastic measures to unlock his secret. Will the modern-day 3 Wise Men be able to ensure that Jak’s formula – based on a genuine 4,000 year old manuscript – remains in safe hands? 3 WISE MEN weaves an intellectual thread into the cloak of intrigue and danger that envelops Jak. 3 WISE MEN is a contemporary thriller at just over 82,000 words. It is set mainly in Milan, Tel Aviv, the French Riviera and on the Italian coast. Author insights for 3 WISE MEN, plus novel extracts, will be posted here. Subscribe for updates on this blog or use LEAVE A COMMENT below to ask any question directly to author James Hayden about 3 WISE MEN!